The apples, pears, peaches, and nectarines set fruit well this spring, despite a couple of cold snaps. The black currants are starting to ripen, and the blackberries are loaded with blossoms. We expect to start picking them over 4th of July weekend. We are running low on hens. It's probably time to hatch some more chicks. We are also planning to breed our dairy cow and maybe get her a few friends. The bees are busy (as bees will be), and the hogs are still grazing and clearing weeds for us. We have been raising American Guinea Hogs for several years now and it is time for a change. We have enjoyed these little guys and gotten a lot of benefits from having them around, but hogs are work. If you've ever tried to keep a sow who is about to farrow from building a nest where she wants to, you'll understand what I mean. They are strong-willed and intelligent, which sometimes makes them difficult to contain, but also makes them good mothers and excellent barnmates for the other animals. The chickens share a space with them and have no gripes (at least none they've ever told me). The cow has decided that she would rather be in the pigs' pasture than in her own, so they are now buddies as well. We are ready to re-home our herd. The mature animals are Brutus, Charlotte, and Rita. 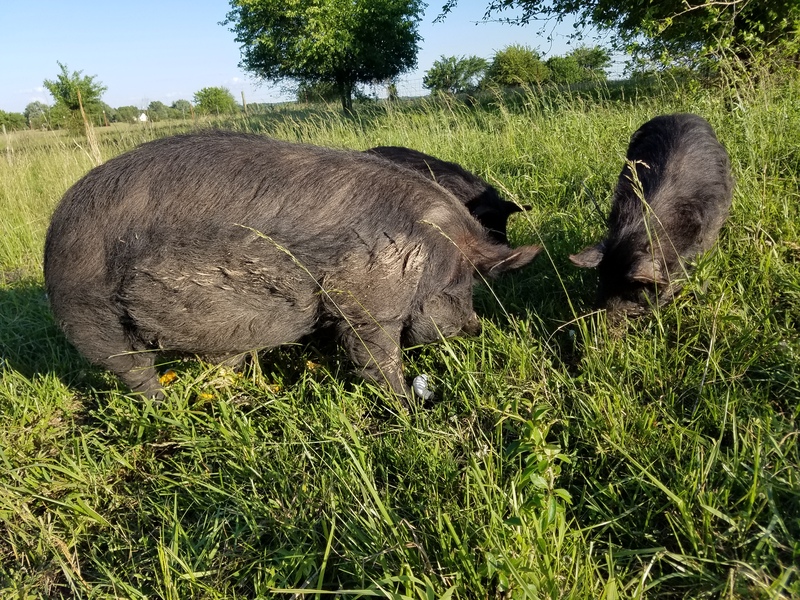 Brutus is a mature intact boar that weighs around 325lbs and has sired many litters for us. Charlotte will be farrowing soon, and Rita has four sucklings that are ready to be weaned. Finally, there are two little ones remaining from this spring's farrowing. They are around 50 lbs. If you are looking to get into hogs, or ever thought you might want to try, this is your chance. If you ring their noses, they'll graze pasture like a cow. I didn't believe it either, until I saw it with my own eyes. If you feed these hogs free-choice feed, you'll get some round little lard balls. They need pasture. If you don't ring their noses, they'll graze it down and then turn it over. They are trained to a wire, so I can move them around easily. I have put them in the garden in the fall and they took it down to bare dirt in a matter of days. They are excellent little bulldozers. What will we be doing instead, you ask? We will be adding some more cows to keep Ginny company. So even if it's not a saying, at least here at the farm, beef is the new pork. I think it will catch on.